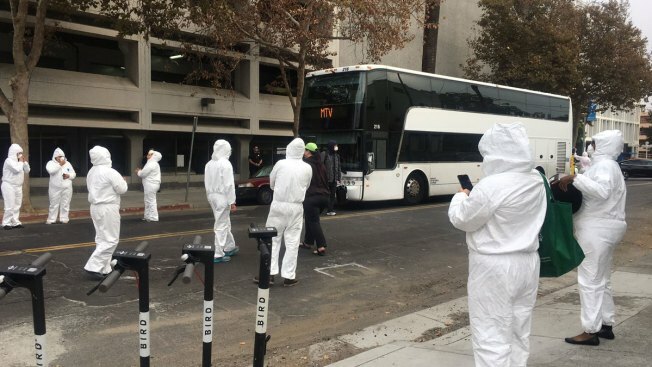 About a dozen of activists dressed in white coveralls blocked a commuter Google bus in San Jose Thursday morning. Holding a large sign that reads "Destroy The Tech-Savior Industrial Complex," demonstrators who stood on the streets near San Jose State University say they are concerned about the impact of Google's planned expansion in San Jose and that it will drive up prices. Demonstrators say they're wearing a mock hazmat suit because Google is "toxic." San Jose Police said protesters aren't allowed to block traffic but they can demonstrate on the sidewalks. Officers later told the protesters to disperse and they chanted "we'll be back." Google announced a major expansion project near the Diridon train station earlier this year. The tech giant said it has spent more than $220 million buying up property on the western edge of the downtown district. In May, dozens of protesters blocked tech commuter buses in San Francisco with e-scooters to voice their concerns about the growing number of homeless people. Protesters decried the "techsploitation" of San Francisco and held up signs that read "your disruption is our displacement."